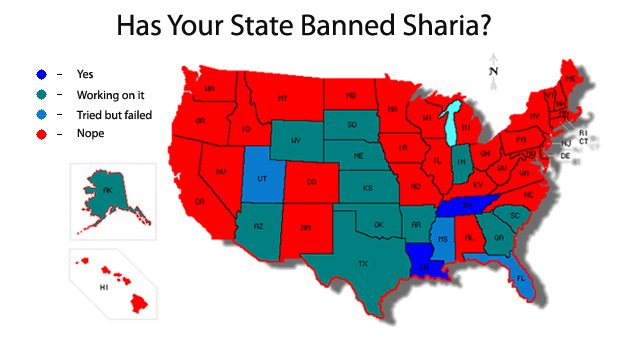 Map: Has Your State Banned Sharia? Earlier this week, a Georgia legislator introduced the “American Laws for Georgia Courts Act,” a bill designed to block the implementation of Islamic law in state courts. As state rep. Mike Jacobs told the Fulton County Daily Report, he couldn’t think of any specific instance of Sharia law affecting Georgia’s justice system, but the government needed to take action. It’s a familiar pattern: While actual Islamic law is virtually non-existent in the United States, efforts to combat the scourge of Islamic law are becoming increasingly common. Passed: Both Tennessee and Louisiana passed variations of the American Public Policy Alliance’s “American Law for American Courts” legislation in 2010. Working on it: Alaska; Arkansas; Arizona; Georgia; Indiana; Kansas; Nebraska; Oklahoma; South Carolina; South Dakota; Texas; Wyoming. Tried but Failed: Florida; Mississippi; Utah.